Chances are, the team at 4 Pines weren't the first Australians to check out their local bars only to conclude there wasn't a single good beer to be found in any of them. Equally, the chances are very few have decided to do something about it by opening a venue and brewing their own. Mostly Western Australian in origin and starved of the quality beer they'd become used to in WA, where the Aussie craft beer revolution started, that's exactly what they did. 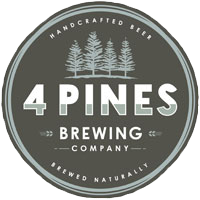 The result of their enterprise is 4 Pines, which started out as brewery, bar and restaurant overlooking the Manly ferry terminal and, particularly since the opening of an ever-expanding brewery in Brookvale, is playing a key role in turning Sydneysiders (and much of Australia) onto better beer. Opened in the middle of 2008 when there wasn't an Aussie craft beer to be found anywhere in the suburb, it rapidly earned a reputation for brewing a quality drop. They started out with four core beers - Kolsch, Pale, Hefeweizen and ESB - but have expanded to a point where those are now complemented by dozens of seasonals and specialty batches every year. The opening of their offsite brewery in Brookvale, which is engulfing its surrounding industrial estate like The Blob, has allowed them to share the love and send more beer outside the local community; even so, demand has grown so fast they've had to meet it with outsourced brewing, although work is underway to bring it all back home. The beers themselves have won as many plaudits as thirsty fans, with the Stout winning Best Stout in the world at a past Australian International Beer Awards, the ESB collecting Champion Pale Ale in the busiest category of the inaugural Craft Beer Awards and the brewery itself bringing home Champion Large Brewery titles at both the Craft Beer Awards and Australian International Beer Awards. Aside from the beer, the 4 Pines kitchen in Manly keeps many locals come back multiple times a week. From an eye fillet steak, to their famous chunky chips the menu covers all bases, while the mega burger and signature beef pie are the stuff of local legend, The venue also hosts live music every Tuesday, Wednesday and Sunday. You'll even find a magician wandering between the tables on Thursdays in what could be an Aussie brewery first, plus special beer nights and themed beer events and festivals, all of which you can keep up to date with by joining their beer club. Since September 2017, 4 Pines has been a wholly owned subsidiary of AB InBev. It became the first Australian microbrewery to be snapped up by the world's largest brewing company after its merger with SABMiller. You can read about the sale here and here. In 2016 they took over the space beneath the brewpub and turned it into something of a playground for chefs and brewers. Decorated with recycled timbers salvaged from a derelict Victorian cottage and soft bunker lighting, the only beers you'll find pouring here are the limited edition Keller Door releases while the food is different from upstairs too, with a focus on share plates, both small and large. You can also join the 4 Pines crew at the Brookvale site. They opened a 21-tap Brookvale Truck Bar alongside the brewery, a huge space purpose built for enjoying the freshest beer possible while standing in the inner sanctum of a working brewery. Built into a 1960 Dodge truck, the taps pour the 4 Pines core range, a rotating showcase of small batch Keller Door beers plus a couple of wines for the yet to be converted. And, completing the picture is another venue in Newport, designed to showcase the brewery's range of barrel aged and blended beers.